Many of might be having the problem of snoring usually whenever you sleep. If you are the only person in the room then it is not at all a big problem, if someone is staying with you and you keep on snoring this not only irritates them but also vanishes their sleep. To our surprise there has been many divorce cases in the courts been applied just because of snoring in the western countries. This usually occurs when the small skinny layers in the throat start to contract and relax making a small vibration. This process creates a strange sound which is often referred to as the snoring. There are some methods being followed till date to get rid of this problem and we have suggested some of them in this article. The peppermint is always considered to be a good medicine in the cases of inflammation. So using this will surely help to bring back the throat layers to its normal position and also cures the infection to provide a good range of inhalation and exhalation during sleep. Some people get acquired to this habit at the flu season. It is equally effective in eradicating both the issues at all times. To make it more effective, mix some amount of this supplement with water and salt and gargle before you go to sleep. 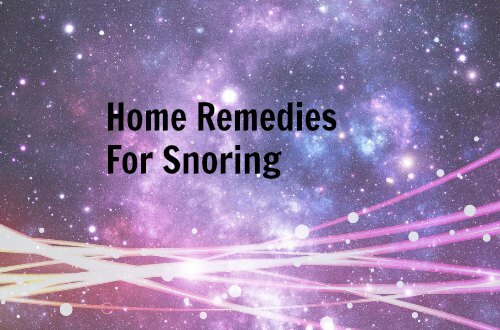 This will ensure that you get relieved from snoring. One another suggestion is to apply some peppermint in the lower portion of your nasal area to stop the infection. Many of you might know or may even have experienced at least once in your lifetime. Take a big vessel filled with hot water and add some eucalyptus solution to it and cover yourself under a blanket with the vessel straight in front of you. Make sure that you intake and leave out the breathe with the help of your mouth since the vapor from this solution pass through the food pipe and the breathing tract and cures the infections and relieves us from snoring problems. Ghee commonly extracted from the butter by natural means in India, is one of the remedies which can help you to stop snoring. Ghee at its purest form can be combined with various other supplements for curing many diseases and snoring problem is one among those problems. The ghee when mixed, with a special type of herb is allowed to heat. The final substance that is obtained after heating can be applied to the nasal area every day before you doze off will provide you a best solution to this problem. You may usually find cardamom in the tea products, it is also a good medicine which can help in curing the nasal problems including snoring. It helps in clearing the air passages inside your mouth and gives access to free circulation of air inside the body. Mix the cardamom powder with warm water and daily consume it before sleeping at night to see better results of relief from your snoring activities. It is not only a extremely beneficial anti-septic and anti-biotic, but it also helps in curing various other problems including the unusual expansion of throat pipes and when added with milk and consumed can be a best medicine for various problems such as cold, snoring etc. Drinking milk added with turmeric will increase the metabolic rate in your body and also provides some resistance and power to your body to fight against diseases. The main role of garlic is the abolition of any type of diseases that occur inside the body and especially in the nostrils. There are certain good effects in the respiratory system which is provided by garlic. Many patients who are affected by sinusitis and this problem can also directly eat the garlic or make it as a paste and include in some foods you consume to get rid of the problems of snoring. Many of might have not heard of this name, which serves its main purpose in producing relaxation to all the muscles in your body and also the nerves in your body. It is very much useful to reduce the swelling that has ever occurred in any part of the body. Add the chamomile powder with water and boil it as a tea and drink the solution regularly to get rid of the snoring problems lifelong. Are you a person who has unusual snoring at unusual time of the year? Then you are said to have got affected by the some infections due to the particular season of the year, causing problems in your nostrils. These problems can be eradicated with the help of anti-histamine and anti-inflammatory supplements that are best available in the market. For preparation, add a bunch of nettle leaves in boiling water and boil it for some time to get a concentrated solution. Make sure of consuming the mixture regularly during the particular season before going to sleep to get rid of the seasonal problem. Natural honey can be a best remedy for this problem. The natural honey can only be obtained directly from the honeycomb of the beehives. Most other honey products that are available in today’s market are mainly a composition of meager amount of honey added with other chemicals. The ultimate medicinal property of the honey is to reduce the swellings and wounds that have occurred in the sensitive parts of the body. Take a spoon of honey and mix it with hot water and consume it daily morning and before going to bed to make sure that all the swellings in the throat and also other sensitive parts of the body.